(Bloomberg) -- Turkey’s governing party will request a rerun of last month’s mayoral election in Istanbul, stoking concerns that the country’s democracy is fraying as President Recep Tayyip Erdogan refuses to concede defeat in the city where he built his political career. The election board had earlier rejected a request by the AK Party for a full recount of votes in Turkey’s largest city, ordering instead a partial recount covering 51 ballot boxes in 21 districts of Istanbul. It has yet to decide on whether to cancel the election in the city district of Buyukcekmece based on a previous request by the party. 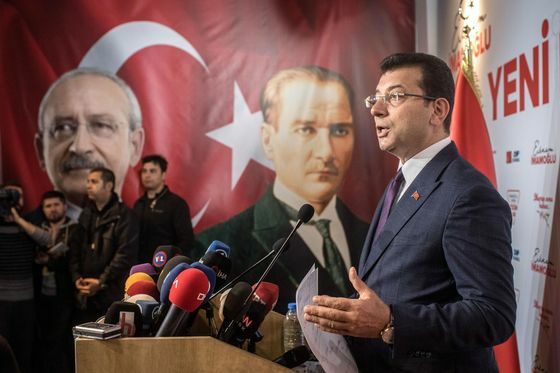 The AK Party will petition for an “extraordinary objection” citing widespread allegations of fraud in the March 31 election, Recep Ozel, a party official assigned to the election board, said by telephone on Tuesday. Erdogan’s determination to push for another vote has fueled concern that an authoritarian streak in Turkey’s government is deepening and has rattled investors in the Middle East’s leading economy. The lira gave up gains on Tuesday as the fight over control of Turkey’s commercial hub continued. The currency has lost about 2 percent of its value since the vote, the most among major currencies worldwide. The government will investigate complaints over possible interference in voter registration by supporters of U.S.-based cleric, Fethullah Gulen, who Turkey accuses of masterminding a failed coup attempt in 2016, Interior Minister Suleyman Soylu said in Ankara on Tuesday. Faik Oztrak, a spokesman for the main opposition CHP party, disputed the AK Party’s claims. The AK Party’s insistence on a redo of the election “won’t change” even if the recount confirms a win by Imamoglu, Ozel said. Imamoglu led by about 14,000 votes as of the last tally on Monday.